Could ORCID iD replace the Swiss edu-ID? Before I bluntly say ‘no!’, let me try to explain why the question arises at all (and why it is reasonable to ask it). The term ORCID ID actually refers to many things. Technically, it is 1) a unique identifier, 2) a login with a username and password and 3) personal attributes associated with the unique identifier. While I initially thought that the ORCID iD was only an identifier, it turned out that the ORCID community has built an extensive set of additional services over the last few years. As an example, ORCID supports OAuth2 authentication, which can be effectively used to implement federated login to services and tools. 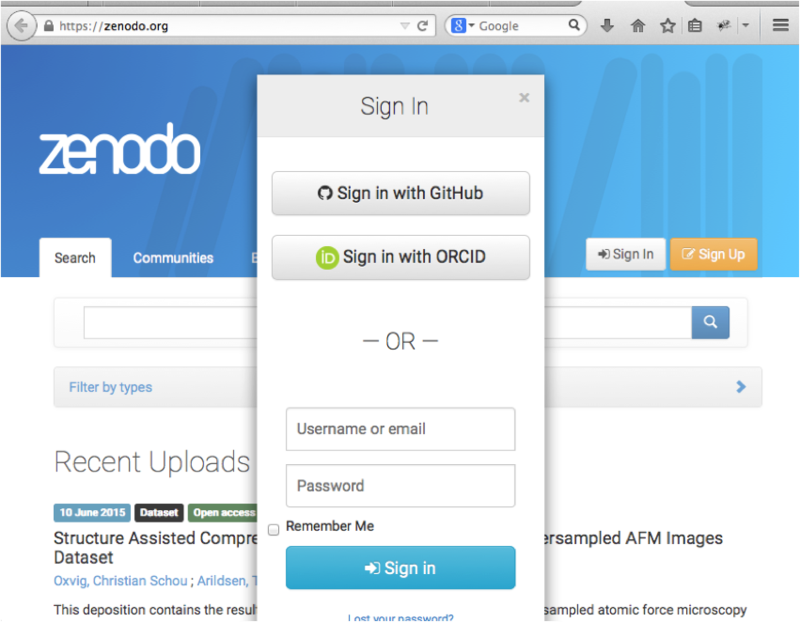 The research data repository zenodo.org already offers the option to log in with the personal ORCiD account (see screenshot). So why are we creating yet another login with the Swiss edu-ID? Couldn’t we use the ORCID iD instead? Indeed, an ORCiD account has many similarities with what we have in mind for the Swiss edu-ID: it is user-centric, aimed at very long-term usage (i.e. lifelong) and supported by the higher education community, so an individual can use it without have to pay a fee. The scope of ORCID is clearly restricted to researchers and authors of research publications. The Swiss edu-ID has to cover a much broader set of users, including students, university staff, guests and library walk-in customers. ORCID’s attribute data model is tailor-made for researchers and encompasses ways to express a person’s biography, affiliations, works and received funding. Within the Swiss higher education community, we also need to represent a person’s role, branch of study, postal addresses and even particular attribute values that are only used at a single university. Even if it were possible to extend ORCID’s data model with the personal data mentioned above, we would still have data-protection issues. It is quite out of the question to store massive amounts such sensitive personal data on servers in the US. While the ORCID iD is not a viable replacement for the Swiss edu-ID, I still firmly believe that both initiatives can perfectly co-exist and that integrating the two is of mutual benefit. The Swiss edu-ID can already import the ORCID iD securely and make it available to services as an attribute. This helps in disseminating ORCID iD in Switzerland, which would definitely be a good thing.